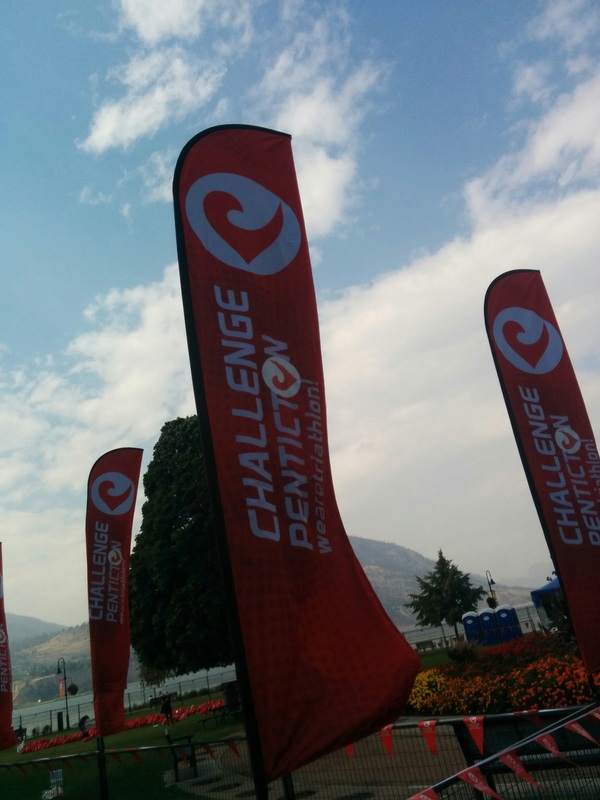 The next week was Challenge Penticton a full iron and half iron distance tri on the old Ironman Canada course. I had been asked if I would complete the swim portion as part of a half relay team whose swimmer had had an unexpected wedding to attend. Kay had signed up for the full distance solo, in the hopes of redemption after the awful weather at Whistler. 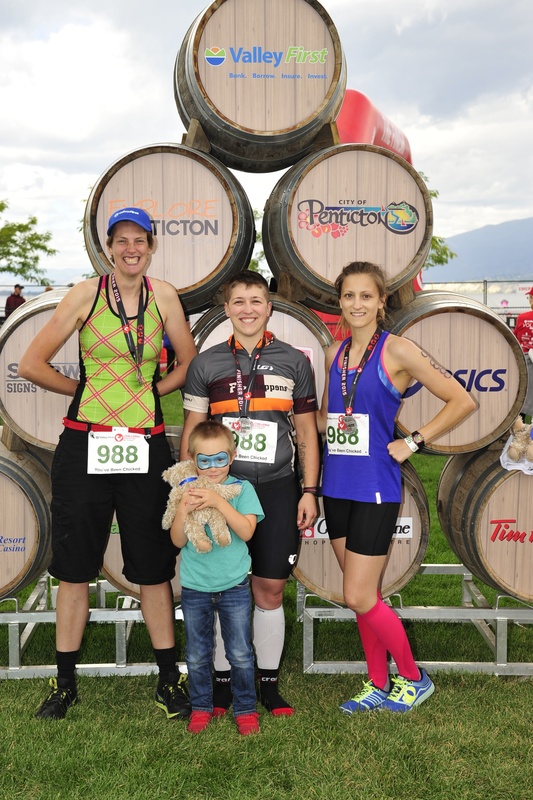 We drove down to Penticton on the Saturday. Small spelling faux pas on the part of the organiser! I took part in a short swim race in the area of the swim course which allowed me to acquaint myself with the course. We then headed over to the registration area. I located the other 2 members of my team; a pair of sisters from Edmonton. I smiled at the odd situation of looking for my team without having the faintest idea who they were. As luck would have it, as I walked up to the check-in area, scanning around for two people matching the photo they had just sent to my phone, I saw them immediately. They invited us back to the house they were renting – and as it was pouring with rain and smoke from the local foes still hung in the air, we were happy to accept! They turned out to be a most wonderful family and I surely appreciated their hospitality. Later, we headed out to rack bikes in transition, and check into our hotel then I had to attend an officials meeting as I would be volunteering once, I was out of the water. Afterwards I went straight to bed. The next morning I woke up in a rush, my alarm not having gone off. I had to pack my bags to leave that evening after the race, whilst trying to eat some breakfast and gather my race gear. 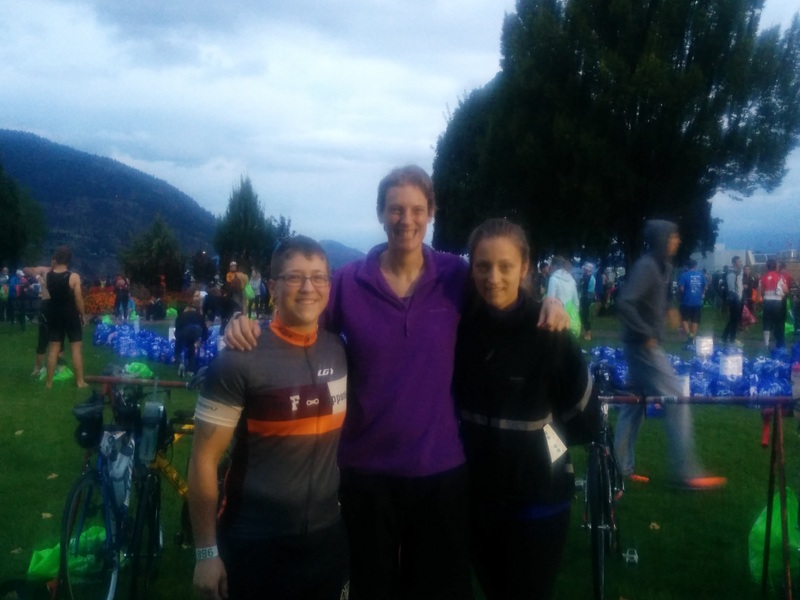 We headed out to transition where I met up with Nakita, our cyclist and Shelby, our runner. I kept bumping into different people I knew further delaying me. I wanted to stop and chat with all of them, but there was not time. I finished getting ready and then walked down to the water. We watched the pros and full distance swimmers start and then I stepped into the cold water to prepare for my own race. I waited, shivering for the start to sound. Being in a relay team added a new dimension to this race. Although my teammates had assured me they were not overly competitive and were only grateful that I had offered to complete the swim portion for them, I really didn’t want to let them down. I worried about my speed, or lack thereof. There was a different kind of pressure. If I failed to complete the swim, neither of the others would even get to race. Of course there was no reason to believe I should fail. I swam on. Every so often someone would hit me as they swam, or swim into me. I had never experienced so much contact during a swim. It felt so long. I finally reached the beach and started running towards the relay transition. I wondered how I would find my teammates, I cast about trying to see them. Then I saw Shelby, running ahead of me, leading me to Nakita. I bent down and ripped off my timing chip, handing it over. We cheered as Nakita headed off to the long bike course. I changed and headed out onto the full bike course (my team being entered in the Half) as a motorcycle official. We zipped around, checking for infractions and warning riders to avoid drafting. The weather had turned and it was pouring with rain. This was good in the respect that it reduced the amount of smoke lingering in the air from the local forest fires. But of course, it was not desirable. It was cold and windy. As I passed Kay on my way to the half course, we exchanged looks. I felt rather mean that my main thought was that I was glad I hadn’t signed up for this race after all. I returned to the finish a little before Shelby was due to come in. Challenge Family events allow all members of a relay team to cross the fish line together; a fun way to end the day. I waited with Nakita and we discussed our respective legs of the event. When Shelby came around the corner, we all jogged together around the red carpeted the finish chute. The young nephew of my teammates was lifted over the fence and he ran in with us, totally stealing the show! The others went home to change and get the barbeque fired up, but I wanted to wait for Kay to come though transition. I stood and cheered athletes coming in and heading out on their runs. Sadly when Kay came in, it was evident that she was having some challenges and she declined to continue. You can read her thoughts on her blog SeeKayTri. We rounded out the day eating burgers and generally having a good time.